The onetime Water Street Station was a Romanesque Revival relic on the west shore of the Maumee River that had been shuttered in 1985, almost nine decades after it opened as an electrical utility and 55 years after its conversion to a steam plant for heating downtown buildings. But Jeff Kuhn only saw potential in the bare brick shell and gravel floor. ProMedica completely renovated and updated the former Water Street Station for its new headquarters. 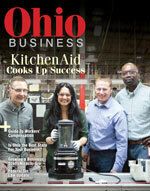 presence might bring to the Glass City’s urban core over the relative ease of building in the suburbs. 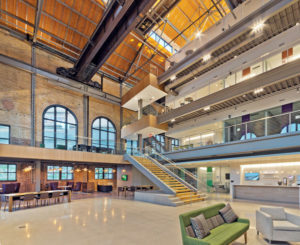 Almost five years later, the steam plant is a showplace of rehabilitation, four floors of light-filled office space for 450 employees featuring art installations such as the thousands of translucent blown-glass spheres—pieces reminiscent of so many water droplets—suspended in the atrium. Another 450 or so workers occupy the renovated Junction, the triangular ’70s building just west of the steam plant that ProMedica purchased from Key Bank. Workers park in the Depot, a new six-story garage just south of the buildings distinguished by its side of colorful LED “windows.” Another 500 staffers are slated to move into another ProMedica purchase, the former Edison Plaza building across the street from the Junction, next year. The $62.5 million campus, completed in late August, has generated another $500 million in investment in the area from other developers and businesses, according to an article on ProMedica’s website. Harlan Reichle of commercial/industrial real-estate firm Reichle Klein doesn’t disagree with the number. He calls the campus “transformative,” a major employer’s “enormous statement” that downtown Toledo is an attractive, viable location in which to work. But establishing that flagship location wasn’t easy, according to Robin Whitney, ProMedica’s senior vice president of strategic planning, real estate and construction. “The challenge was, ‘Could we figure out a way to do something downtown that could be done economically?’” she says. Historic and new-market tax credits defrayed the cost of turning the steam plant into a state-of-the-art office building by approximately $10 million. Contractors removed the roof and unstable east wall to construct the structural framework needed to support four floors of office space. Windows were replaced and energy-efficient hot-and-cold-water heating/cooling installed in the floors in front of them to control temperatures near brick walls devoid of insulation. 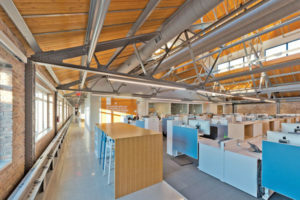 A three-story addition with a 15,000-square-foot footprint was built to the east, doubling the width of the building. And the plant’s signature twin smokestacks, too structurally compromised to save, were replaced by steel counterparts 20 feet shorter and 1 1/2 to 2 feet narrower. Whitney explains that the variation in height put the smokestacks under 200 feet, eliminating the need to comply with a Federal Aviation Administration requirement for special lighting. “The original ones were about 13 feet in diameter,” she adds. 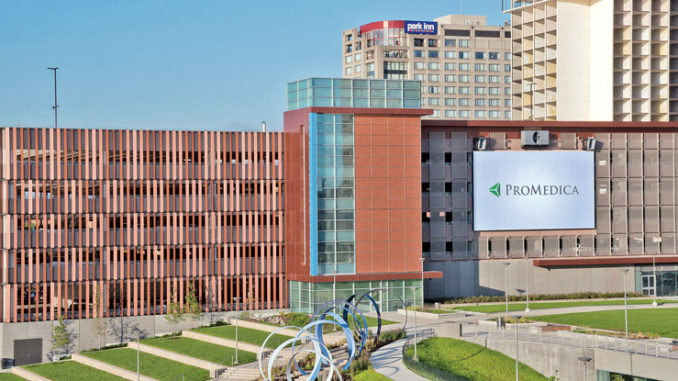 “Just the pure logistics of trying to ship new ones here of that diameter—they wouldn’t have been able to put them on trucks and get them under the overpasses on the highway.” ProMedica’s investment in downtown Toledo didn’t stop at its campus borders. In 2014 the health system bought the struggling Grand Plaza Hotel, just two addresses north of the steam plant, and sought out a developer to transform it into upscale accommodations, “something wonderful that would be an amenity not only for us but for the entire downtown,” as Whitney puts it. Chicago-based First Hospitality Group bought the place and turned it into a Marriott Renaissance Hotel. The health system’s own tenants include City Egg, a fast-service version of sister Scramblers eateries, and a yet-to-be-announced bank branch, both of which signed leases for a combined 5,000 square feet of retail space on the Depot’s first floor. The upscale Chop House and a Barry Bagels outpost occupy approximately 8,400 square feet on the Junction’s first floor, the YMCA 10,000 square feet in the building’s basement. “There’s been a desire to move our YMCA more into the central business district for probably 15 or 20 years,” Whitney notes. Whitney admits that many ProMedica employees were hesitant to move downtown. Those participating in focus groups voiced concerns about issues such as safety and parking. “[But] as people started getting more and more involved in it and started seeing what we were doing, it really started to change—it started to [generate] some excitement,” Whitney says.